Track A2 was not written by Jesse Reese but Bill Carey (2) and Carl Fisher (2). 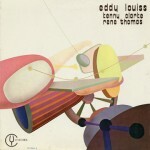 Track B1, Nardis, was not written by Eddy Louiss but Miles Davis. Track B3 is not « Groovin’ Hight » but « Hot House », written by Tadd Cameron.